According to UBA’s new free special report, “2016 Trends in Employer Wellness Programs,” 67.7 percent of employers who offer wellness programs have incentives built into the program, an increase of 8.5 percent from four years ago. Major lawsuits are pending against employers with particularly robust wellness programs and the regulatory environment is becoming increasingly restrictive. 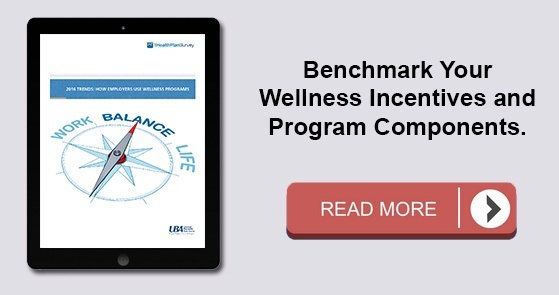 As a result, employers are continuing to pursue wellness programs, but they are being very cautious with program design, avoiding implementing high penalty and incentive programs. Incentives are the most prevalent in the Central U.S. (76.1 percent), among employers with 500 to 999 employees (83.2 percent), and in the finance, insurance, and real estate industries (74.7 percent). Last year, employers in the Southeast were the regional leaders in wellness incentives (75.9 percent), growing 24 percent since 2012. But this year, prevalence of incentives dropped more than 17 percent in just one year, perhaps indicating regional caution amid the uncertain regulatory environment. The West offers the fewest incentives, with only 48.3 percent of their plans having rewards. The smallest employers (fewer than 25 employees) have seen significant shifts in wellness incentive design over time. Prior to 2016, health club incentives were on the decline and cash incentives had been increasing 80 percent since 2012. But 2016 shows a dramatic pendulum shift from 36 percent of plans featuring cash incentives in 2015, to only 16.2 percent of plans offering this design in 2016. Also, dramatically shifting away from cash incentives are construction, agriculture, mining, and transportation employers (going from 63.8 percent in 2015 to 48.4 percent in 2016). The finance, insurance, and real estate industries offer the most health club-related incentives (50.0 percent). Southeast employers, on the other hand, are shifting away from health club-related incentives to cash toward premiums, 401(k)s, and FSAs with nearly a 60 percent increase in this type of incentive (going from 47.1 percent to 74.7 percent over four years). Offering paid time off (PTO), historically a seldom-offered wellness incentive, is becoming rarer with 4.5 percent of employers offering this incentive, nearly a 20 percent decrease from four years ago. The majority of these PTO-based wellness incentives are seen in the Southeast U.S. (13.1 percent – a nearly 50 percent increase from 2015) and within the finance, insurance, and real estate industries (10.6 percent). Employers are beginning to use the regulations proposed by the Equal Employment Opportunity Commission (EEOC) as their guidelines for program development, and the wellness guide provided by the Patient Protection and Affordable Care Act (ACA) have re-empowered employers to implement premium differentials for wellness participation and cessation of tobacco use. However, many are likely wary of the EEOC’s new guidance regarding wellness programs that include health risk assessments, biometric screenings, and medical exams. How those regulations influence plan design remains to be seen. Read our breaking news about UBA’s new wellness special report. Download our free (no form!) special report, “2016 Trends in Employer Wellness Programs,” for more information on regional, industry and group size based trends surrounding prevalence of wellness programs, carrier vs. independent providers, and wellness program components. For complete findings within the 2016 UBA Health Plan Survey, download UBA’s 2016 Health Plan Survey Executive Summary.